Gondolas, grand canals, gelato; there’s nowhere quite like Venice. Famous the world over for its canal network, and referred to often throughout popular culture, Venice is the ultimate romantic destination, as well as being a stunning city to visit year-round. With awe-inspiring Venetian architecture; art galleries brimming with Titians, Caravaggios and other world famous Italian artists; and a fashion offering second to none, Venice has a lot to offer its visitors. Venice Marco Polo Airport services this truly unique city, and is located 8km (4.9 miles) north of the city, in Tessera. Marco Polo airport serves as a base for easyJet and Volotea airlines, whilst Venice’s second airport – Treviso Airport – is slightly further out of the city, but is home to low-cost airlines such as Ryanair and Wizz Air. 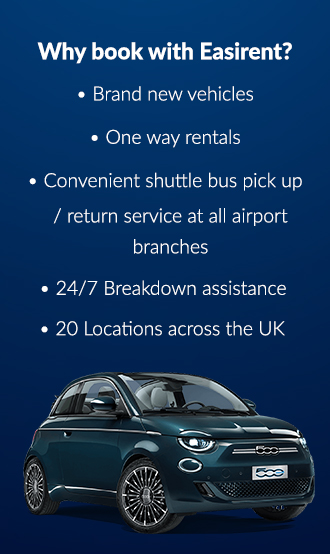 Picking up your holiday hire car from the airport couldn’t be simpler, and once of the dedicated team of staff have helped you on your way, the world is your oyster. The capital of the Veneto region, Venice was ranked the most beautiful city in the world in 2016, and it’s easy to see why. The city is a collection of 118 small islands in the shallow Venetian Lagoon, all separated by canals and connected by over 400 bridges, and in more recent years, part of the city and the lagoon have been designated World Heritage Site status. Known by many names, including ‘Queen of the Adriatic’, ‘City of Masks’, The Floating City’, ‘City of Bridges’, and the ‘City of Canals’, Venice is the birthplace of Antonio Vivaldi,Giacomo Casanova, Marco Polo and Tintoretto, as well as many other notable people who have chosen to call the city their home. There’s plenty to see and do in this enchanting city: galleries, shops, cathedrals, walking tours, and more, as well as some of Italy’s delicious food and drink offerings. If you’re looking to stay in the heart of the city, there’s no better place than Al Ponte Antico. Housed inside a 14th century palace, this hotel oozes sophistication and decadence; from the silk curtains and gilted interiors, to the stunning view of the Rialto bridge outside your bedroom window, there really isn’t a more perfect place to lay your head for the evening. Take advantage of the daily breakfast on offer, which includes locally-sourced eggs, pastries and vegetables, as well as some homemade fresh pastries and delicacies. Located in Cannaregio, just a short 1.55 kilometre trip to the Venetian city centre, you’ll find the Venice Halladis Apartments. These bright and airy apartments are perfect for groups, or for those wanting a little more privacy on their holiday. A real rarity in this Italian city, these modern apartments which sit inside a renovated warehouse building, are spacious and well equipped with a kitchen and laundry facilities. There’s also mood lighting in the bathroom, which allows for a Turkish baths-feel, while you relax after a day of exploring the region in your holiday hire car. Looking for a bed and breakfast? Look no further than Le Terese, an 18th century building which has only two rooms, both overlooking the canal. This cosy and personal accommodation is the creation of Antonella and Mauro, and features a simplistic and understated design throughout. In each room you’ll find a coffee machine, free WiFi, toiletries and a hairdryer, and there’s also space to store your luggage in the reception. Venture out of the city centre to Murano Palace, a lovely little bed and breakfast in the Murano area of Venice. Famous around the world for Murano glass, the area is quieter and more traditional than the centre of the city, with many of the shops closing around 18:00. The Murano Palace is a gem in the heart of the area; located in a restored 18th century house, the bed and breakfast is decorated beautifully throughout, with high ceilings and priceless Venetian fabrics adorning the walls. With free drinks and snacks in the minibar, guests can also enjoy a freshly made continental breakfast each morning. This hotel is located just a 25 minute drive in your rental car from Marco Polo Airport. Italy is famed the world over for the calibre of food and drink that it produces. Home to the classic dishes that we all know and love, there’s plenty of opportunity for a Venetian feast while you’re in the city. A great location to enjoy locally-sourced seafood, Venice has some great fish restaurants and the restaurant, Riviera has been rated as one of the city’s best. Owned by GP Cremonini, a former rock musician, this restaurant sits on the banks of the Giudecca Canal with spectacular views across the city. Serious foodies should invest in the seven-course tasting menu, which costs €105 per person. Italian pastries can be the stuff of legends, and the pastries from Pasticceria Tonolo certainly seem to be. A firm favourite amongst tourists and locals alike – evidenced by the long queue of hungry customers patiently waiting for their pastries. Make sure to arrive early to get the freshest marsala cream pastry, or chocolate croissants. For a modern Italian menu, make sure to stop by the Ristorante Quadri, which is located in San Marco. But be aware that this modern menu is Michelin starred, so make sure to book in advance as this place gets pretty popular with food fans. A small team of waiters greet you upon arrival and show you to your table in the small, cosy restaurant. What follows is an evening of culinary delights and inventive twists on classic dishes. Take a break from touring the local area in your holiday hire car, and stop by the Pasticceria Dal Mas, a delicious bakery in the heart of the city. A recommended purchase is the freshly baked quiche, which can be bought fresh out of the oven in mid-morning. Venice has an eclectic mix of traditional wares for sale in its many boutiques and stores across the city; think: Venetian masks and Venetian blown-glass, as well as designer clothing and accessories. If you’re looking for traditional Venetian outfitter, look no further than Monica Daniele, a truly unique shop which specialises in authentic Venetian clothing. The shop’s claim to fame is the tabarro, a traditional garment which was worn by the likes of Cassanova many centuries ago, and until recently was lost to obscurity. The store also sells traditional felt hats, which will cost you a lot less than a tabarro (these will set you back around €500 for the most basic version) but are still pretty pricey nonetheless – yet you get what you pay for, and these garments are definitely the finest in Venetian craftsmanship. Take home a proper souvenir when you visit Venice, and invest in your very own miniature, handcrafted Gondola. The creation of Gilberto Penzo, these model boat masterpieces come complete with full sails and are awash with vibrant colour and gold leaf additions.You can find the store near the Frari, and although the statement pieces are on the pricier end of the spectrum, there’s also many different self-assembly pieces which are much more budget friendly. The streets of Venice are lined with curiosity shops and antique dealers, but one of the best to check out, if you’re after a unique gift for a loved one, is Il Baule Blu. Located on Calle del Mandoler, this charming little shop has anything you’d need if your interest is in vintage 20th century clothing, accessories and homeware. With wares from all over the world hidden amongst the curiosities, you could find yourself nabbing a real bargain in here – be aware, though, this shop doesn’t accept credit cards, so make sure that you have enough cash on you to pay for your purchase. With a vibrant contemporary art scene, classical music venues, and more galleries and museums than you can count on both hands, there’s something for everyone in the labyrinthine city of Venice. For a taste of the city’s inextricable link with classical music, head to La Fenice, the city’s stunning historic opera house. Atmospheric and lavishly decorated, with gold leaf and high ceilings, this place is a real marvel; you can almost feel the history as you sit back in your chair and enjoy the modern day, Venetian musical prowess. Of course, this is the spot if you’re looking to take in some operas from the golden age of Italian opera, however these are the shows that are in highest demand, so make sure that you book months in advance in order to avoid disappointment. But don’t worry if you’ve not made a booking in advance, as La Fenice also puts on contemporary music showings, ballet and concerts; you can also take a tour of the theatre itself, with no booking necessary. You can’t take a trip to venice without hitching a ride on a gondola – the city is world famous for them! Swap your rental car for a gondola tour, a real Venetian tourist ritual, but make sure to shop around for a good deal as there are a lot of overpriced gondoliers selling tours across the city. Gondolas can usually carry six people, and cost around €80 – quite a steep price, but if you’re splitting it, it’s much more bearable. There are also ferry gondolas, called traghettos, which will pick you up and taxi you from A to B at the cheaper price of €2 per person. Venice has a rich artistic history, and there’s no better place to see it than the Gallerie dell’Accademia. Inside the gallery walls you’ll find some of the best art that Venice has to offer, from Tintoretto to Titian, Bellini and beyond, you could quite happily while away a day in here, plus, your ticket will also give you entrance to the Palazzo Grimani in the Castello district of the city.